EAST VILLAGE — Astor Place and Cooper Square are getting a pedestrian-friendly makeover. Construction began this week on a $16 million overhaul of the heavily trafficked area, which will get two new pedestrian plazas, 60 additional trees, planters, seating and lighting, city officials announced Thursday. "This is a terrific project that will streamline the street grid and bring new pedestrian and green space to an area that's teeming with foot traffic," said Department of Design and Construction Commissioner David J. Burney, who is overseeing the work. The design by the New York City firm Weisz + Yoes Architecture (WXY) will take more than two years to complete. The construction is beginning as the bustling thoroughfare to St. Mark's Place sees new developments like the huge office tower at 51 Astor Place and an announcement that Facebook will relocate its New York City base nearby by early 2014. 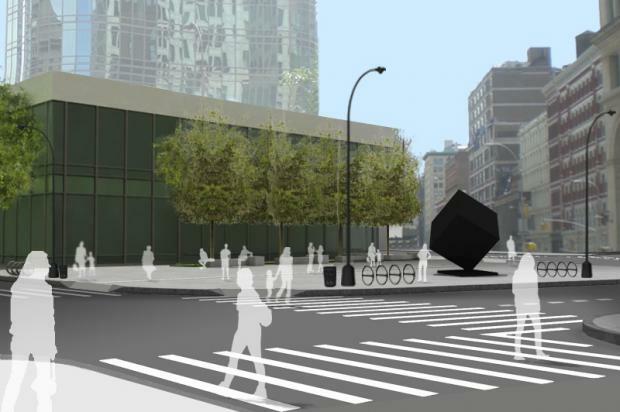 One of the new pedestrian plazas will shut down Astor Place to traffic between Cooper Square and Lafayette Street, adding green space around the famous spinning cube, which is called "Alamo." The pedestrian space will be named "Alamo Plaza," renderings show. The city will also build a tree-filled pedestrian plaza in front of the Grace Church School's new building, taking over a portion of the roadway on the west side of Fourth Avenue between East Fifth and East Sixth streets. In addition, the project will widen sidewalks on Fourth Avenue between East Fifth and East Ninth streets and on East Eighth Street between Lafayette Street and Third Avenue. Work began this week on a new drainage system for the area, and construction of the new pedestrian plazas will start later this year, the DDC said. Plans for the project have sparked concerns that artwork by East Village resident Jim "Mosaic Man" Power could be moved or lost. Power has adorned dozens of the neighborhood's light and traffic poles with colorful mosaics over the past two decades, including many in and around Astor Place. "They should not be removed," said Power, who plans to put up signs saying the mosaics are in danger. "We are being pushed around by this so-called redesign. This is our neighborhood," he said. A spokesman for the Department of Transportation, Scott Gastel, told DNAinfo New York in an email that the DOT and DDC are working on a plan to preserve the mosaics.